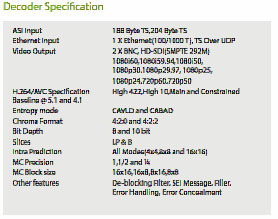 Tata Elxsi has off the shelf available FPGA implementation of H.264 Ultra low latency encoder and decoder with end to end latency of 13ms. 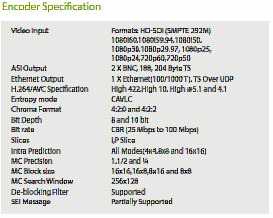 Tata Elxsi’s FPGA based H.264 HP ultra low latency (ull) codecs have been licensed by some of leading broadcast camera and equipment manufacturers. The H.264 ull Codec solution features Tata Elxsi's new subjective quality based rate control algorithm, tested and quality tuned to broadcast content. H.264 ultra low latency codecs are developed for broadcast delivery solutions for high quality video content broadcasting and editing. However, Tata Elxsi can also provide customized solution of H.264 for different use case scenario where broadcast quality of video is not the requirement.